Baba ji, was the last Akali Jathedar of the Akal Takht before the British created SGPC, and sadly used a large group of women to attack the Nihangs. (Nihangs do not attack women or children). Baba Ji's bones were broken, he said to the girl, 'you are like my daughter, but if it pleases you take out your anger out. 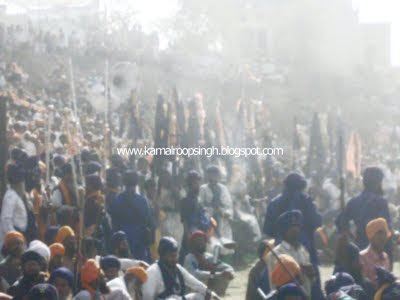 After this Jhabbar and his neo-Sikh crew made sure that they disposed of Dasam and Sarbloh Granth, and any other traditional Khalsa practices. Baba Ji was given his name by an earlier Jathedar after seeing his remarkable spiritual powers. This was written out of by the people in charge of the printing press, but not the oral history of the Khalsa Panth. 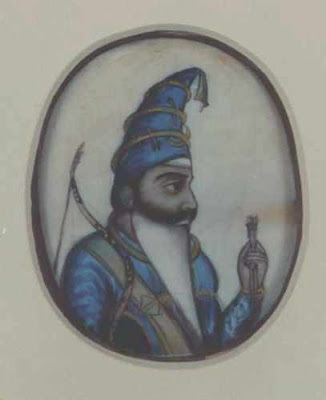 Dhan Dhan Akali Baba Sahib Singh Ji Kaladhari, who made it possible for Singhs to carry a shastar and wear blue, in the dark days of colonialism. Akali Baba Santa Singh giving Santhia of Sri Sarbloh Granth Sahib to a young Nihang Singh at Sabo Ki Talwandi Dam Dama Sahib, 2-1-2004 filmed by Nihang Baba Katapa Singh. Baba Santa Singh Ji learnt his Santhia from the Sikh Brahmgiani Akali Baba Mitt Singh Ji, at Mata Sahib DevaChioni/Gurughar at Nanded. 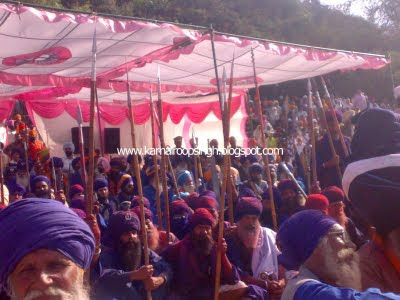 This is internal Taksal of Shiromani Panth Khalsa Akali Buddha Dal Panjva Takht. Baba Santa Singh Ji taught may Singhs before he left his body a few years ago, he was around 107 years old.Sarbloh Granth Sahib is also known as Sarbloh Guru Darbar, Sarbloh Parkash, Manglacharan Puran. In the last one hundred years of Sikh history, there has been one outstanding Brahmgiani that nearly led the Panth to its former Sovereignity. This was the great martyr, Giani, Saint, warrior, teacher Jarnail Singh Khalsa. Sant Jarnail Singh Ji Khalsa was a great theological scholar on the lineage of Akali Baba Deep Singh, he tried to unite the Panth, to get Sikhs back into Dharam, and able to fight the ideological, political, physical and spiritual struggle against the oppresive forces of the GOI. 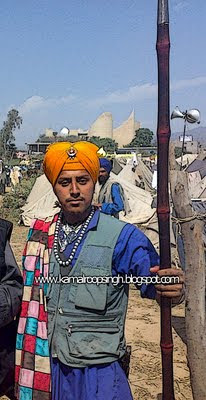 He along with thousands of Sikhs gave their heads to protect Sri Darbar Sahib, and the Akal Takht from the Indian Army. May we all remember our great Shahid Singhs and Mahapurush! Sat Sri Akal!!!!!!!!!!!! 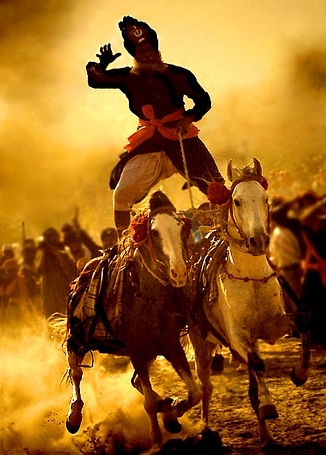 Vahiguroo Ji that battle cry, is bearing onward still, The wild Akalis onward rush, they struggle up the hill. Its Phoola Singh who heads the band, but sure I saw him fall, When first he led his heroes on, struck by a musket-ball: Now mounted on an elephant, he leads them on again, But much I fear, five hundred men, will waste their lives in vain. 'Come on Sikhs! Come on once more,' cried out the brave Jathedar Come follow me, and we will change, the fortune of the war.' 'Vahiguroo Ji Ka Khalsa Vahiguroo Ji Ki Fateh' he cried; But not a Khalsa soldier still, to that wild cheer replied. Their silence, nor their trembling looks, did that fierce chief dismay, But boldy with his gallant band, he rushed into the fray: The Afghans nothing loth came down, the fight grew fiercer still, Yet onward press the gallant few, for that contested hill. Like hailstones rained the leaden storm, around, above, below, But yet the dauntless lessening band, press onward on the foe. Their leader on his elephant, still forward led the way, His was the guiding spirit still, above the bloody fray. , And higher up that bloody hill, they bore the tide of war. 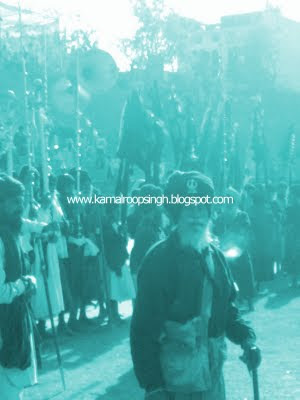 Again the Khalsa troops advance, remembering former fame; They burn to wash in Afghan blood, the morning's marks of shame. Phula Singh had, as an Akali (a Sikh ascetic class), great influence with his countrymen. The Maharaja tried for years, with half sincerity to capture him, and the English drove him from place to place, but could never seize him. At this very time, when Partab Singh joined him at Makhowal, the Maharaja had sent the most positive orders for the Philor troops to drive him out of his territories. The garrison was accordingly marched against him, but when they approached, Phula Singh sent to ask them if they would kill their Guru (spiritual teacher.). The Sikhs would not molest him ; and the whole force was kept out some two months to prevent his plundering, marching where he marched, more like a guard of honour than anything else. Numberless stories of the same kind can be told of Phula Singh, who was a very remarkable man. He was a robber and an outlaw, but he was nevertheless a splendid soldier, and a brave, enthusiastic man. He made friends with Ranjit Singh later, and won for him the great battle of Teri, in which he was killed, in 1823. 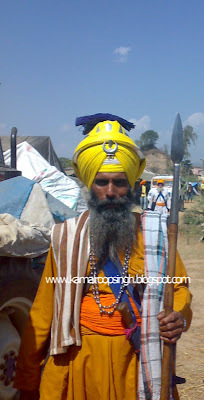 Akali Baba Santa Singh 96 Crore Jathedar Shironmani Khalsa Panth Akali Buddha Dal Panjva Takht Chalda Vahir, Vishav. 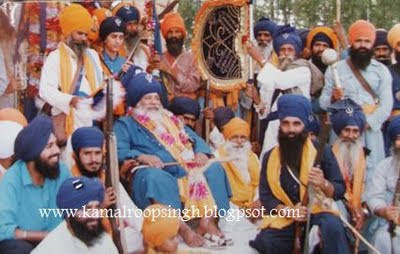 A photograph of Baba Ji in around the 1980's when Baba Ji. 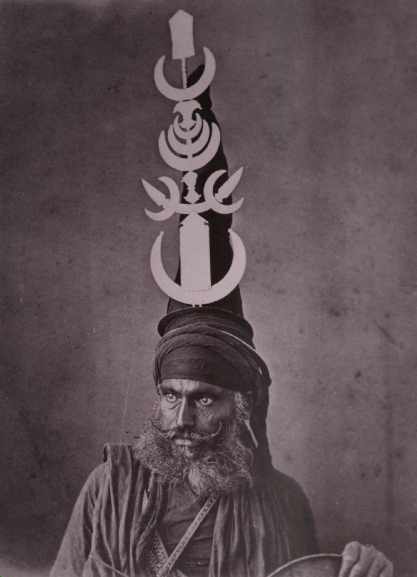 In this photograph he is watching shastar-vidiya and wrestling with the Singhs. The Persians and the residents of Firangistan and France, people of two different colours (black and white) and the Mridangis (inhabitants) of Makran sing the songs of Thy Praise. The people of Bhakkhar, Kandhar, Gakkhar and Arabia and others living only on air remember Thy Name. At all the places including Palayu in the East, Kamrup and Kumayun, wherever we go, Thou art there. 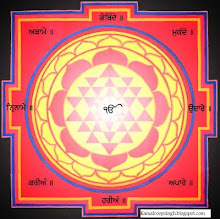 Thou art perfectly Glorious, without any impact of Yantras and mantras, O Lord ! The limits of Thy Praise cannot be known.14.266.